My cancer remains in remission, praise the Lord! I attend clinics every two weeks for maintenance chemotherapy in injection form. I also take a daily chemotherapy tablet every 3 weeks out of 4. My current assignment is in Ardaghey parish about 10km west of Donegal Town. LATEST PERSONAL UPDATE: 2nd Jan, 7th August. I propose a number of different ways of considering the questions raised. They are listed in order of ascending length/depth. I like Stephen Fry a lot. In fact, I’m one of his 8.6 million followers on Twitter. I like him on QI. I loved him in Blackadder. I even quite liked him in that other show where he drove around America in a London taxi. He is funny, articulate, frequently kind, and much cleverer than me. As an admirer, I’m also one of the 3 million people who viewed his recent rant against God which began on an Irish chat show and went viral (you can watch the video at the bottom of this feature). It’s a sensible question. And the answer is, of course, that he shouldn’t, he mustn’t, respect such a deity. And neither do I. Let’s not leap to defend a god we don’t believe in. We have a name for a ‘capricious, mean-minded, stupid’ being, but it isn’t ‘God’. Fry refers to bone cancer in children and a particular East African worm which burrows into the human eye. The bible goes further. Its oldest book is a catalogue of unmerited suffering endured by Job. Genesis wrestles with familiar questions about the existence of evil in our world, describing a cataclysmic moment at which every kind of tragedy somehow took root: cancers began to grow in children; the East African Loa Loa eye-worm gradually evolved in horrible ways unintended by its Creator. And, of course, the crux of the Christian faith is the cross: a moment of unimaginable and undeserved suffering. 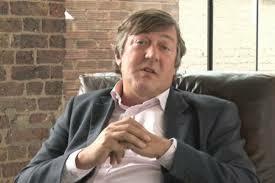 Those gospel writers didn’t believe in the God Stephen Fry doesn’t believe in either. They believed in a God of such humility and love that he held himself culpable for the terrors of this world on the cross, and paid the ultimate price to rescue us from it. ‘Where is God? Where is God now?’ But another person pointed to the child’s corpse and wept: ‘There he is, hanging on the gallows’. This is the tragedy at the heart of Christian faith: the belief that God suffered with us, like us and for us. That God is not distant, malignant or dispassionate. The cross, if it means anything at all, means that he identifies with us in our suffering, and that he is not yet fully in control. Evil things happen which God does not want or intend. When a woman is raped, this is not the will of God. When a child is sold into slavery, God is not the perpetrator but the victim. And then the resurrection of Jesus means that evil will not prevail forever. One day, East African eye-worms will become extinct. Bone cancer will be banished. Sickness and death will be no more. As the last book of the bible says, there will be no more crying and no more dying. Our indignant cries ‘How dare you? How dare you?’ will be silenced in the end by the cross. We worship God for the fundamental goodness, beauty and purpose of life. Looking into the face of a new-born baby, or listening to an exquisite piece of music, or gazing up at the stars open-mouthed, we know two things for sure: Firstly that these things somehow mean something – they are not accidental. They have been purposed, intricately designed, made. Secondly, that they are entirely good; not the perverse creations of a malignant, sociopathic or schizophrenic imagination but a reflection of something or someone infinitely beautiful and benevolent. Fry blames God for the evils of life and as Christians we may sometimes share his sense of outrage, praying ‘How dare you? How dare you?’ But ultimately we attribute evil elsewhere; discerning a battle between the unalloyed goodness of God and the destructive machinations of hell. I feel a little weird writing about such things even though I know them to be true. I’m aware that biblical cosmology can seem a little archaic to Western minds; like a medieval storyline in a Marvel comic. And yet this bitter conflict is a daily reality in our lives. Just read the headlines today, whatever day you happen to be reading this. We know that for every thousand people who care for children, someone somewhere will abuse one. For every hundred doctors, nurses, and medical researchers, there is a chronic illness that still cannot be cured. And within every one of us there are destructive temptations we barely dare acknowledge. There is a battle between good and evil, that God will one day win. Of course, none of this would convince Stephen Fry. Arguments rarely change anything and I’m hardly in his intellectual league. But I’d love to take him to meet some of my friends who are hospital chaplains and Aid workers and counsellors and priests. They work amongst those who are sick and suffering, and would tell him in no uncertain terms how Jesus often brings such people unspeakable hope. Multi-millionaire celebrities may rail against the injustices of life, but meanwhile the poorest, most oppressed people on earth frequently exhibit resilient faith in the goodness of the God Stephen Fry currently rejects on the basis of the tragedies they themselves endure. It’s a fact that the atheist paradigm, whether or not it is true, is a minority belief system and that it is declining globally. Perhaps this is because atheism offers no real comfort and hope to those who are suffering, teaching as it does, that human beings are merely highly evolved accidents, lost in space, in a meaningless universe, and that our suffering is of no consequence in the greater scheme of things. In contrast the Christian faith is growing globally, especially in the poorest parts of the world, perhaps because it proclaims the good news that our lives are consequential; that we are loved and eternally cherished; that this world is being renewed without bone cancer and eye worms; that the oppressed shall overcome their oppressors; that God suffers with us; and that death itself will not be the end. This entry was posted in Uncategorized on February 3, 2015 by frmorty.